Orders containing livestock are shipped out Monday to Thursday on a next day service. If you require your order to arrive on specific day (Tues-Fri) this can be requested during the checkout process. If for any reason we are unable to deliver your order on the requested arrival day (Not enough time, Cold weather, postal strikes etc.) we will contact you by to notify you by e-mail or phone of the delay and re-arrange another suitable arrival day. Please note when ordering that the delivery cost is for a guaranteed next day delivery from the day we send rather than we are guaranteeing a next day delivery from the day the order was placed. Though we can get most orders out the same day on busy days or orders placed in the afternoon we may not be able to get them out the same day. If no arrival day is requested it is assumed any day is fine for delivery and your order will be sent the following day to arrive the day after. We will confirm by e-mail that your order has been sent on the day of dispatch and when you should expect it. It also possible to check the progress of your order by logging into your account, once an order has been sent it will have the “Dispatched” status. Please not any orders containing livestock or heavier order sent using TNT (See below) will require someone to be present at the delivery address to receive and sign for the goods. If this is not possible consider an alternative address i.e. neighbour, relative or your work address. If you wish to change the delivery address or arrival day please contact us as soon as possible, we will need at least 24 hours notice. Livestock: Small orders containing just livestock are sent by Royal Mail Special Delivery which will arrive the day after dispatched before 1pm. Large orders are usually sent by TNT which will arrive next day before 6pm. Livestock only orders are charged at flat rate of £8.99 regardless of the amount of animals ordered. Livestock & Equipment: Small orders less than 1kg are sent by Special Delivery to arrive next day before 1pm, orders containing small things like Tweezers, thermometers & Livefoods etc will be under 1kg. For larger orders that are over 1kg we use TNT to courier your order which will arrive the next day any time up to 6pm. If you order contains any heavier items like Terrariums, substrates, plastic containers etc. It will go by TNT. The cost of shipping is dependent on weight and is £8.99 for the first 10kg with a small surcharge for order over this weight. We also offer a before 12 services at £12.99. It is only possible to send orders by TNT within mainland UK. Equipment & Livefood: Orders containing just equipment and livefoods are sent by 1st class post up to the point it is cheaper to send using Yodel and then TNT. As Royal mail now price the postage by box size on really small items can be posted. Anything bigger it is cheaper to send using Yodel which takes 3-5 days to arrive. Heavier orders or orders needing to be split into multiple boxes are sent using TNT. If you want to add more items to an existing order you will need to place a second and select the “Equipment only” shipping option. If adding livestock you won’t be charged additional £8.99 for livestock shipping. Alternatively you can always give us call and we can take details of the additions you require and payment details over the phone. We send out 1000+ spiders each month and have spent years refining and developing the way we pack. We have the best packaging in the business and guarantee live arrival of a healthy spider. Spiders are individually packed in moist cushioned containers which are clearly labelled with the contents. The containers are then packed into a box with poly chips to protect the spiders and insulate the box. During colder months we also include a disposable heat pack (looks like a big T-bag) to keep the spider warm during transit. If you’re unable to receive an order at your home address during the week rather than taking a day off to receive the order consider shipping to your work address. There is an option during checkout if you would prefer the box not have “Live Insect” stickers on the box so it can be delivered to a work address without causing complications. The spiders will be fine left in the box until you get home. Shipping container for large spiders. Cold Weather, Public Holiday & Postal Strikes: We will delay shipping if the conditions are not considered suitable or the package could possibly be delayed. If this is the case we will keep you updated and advise when shipping is possible. Late delivery: Occasionally packages are delayed on route resulting in the package to arrive a day late. Should you not receive your package the day after confirmation of delivery please contact us and we can look into the problem. Attempted delivery: If a delivery attempt is made and there is no one in at the delivery address to receive the order a card is usually put through the later box with details and further instructions. The package may be left with a neighbour or returned the depot for re-delivery the following day. If it has been sent by Special Delivery you can usually collect it from your local sorting office in the afternoon taking the card and a form of ID with you. Have the enclosure set up and ready before opening the shipping container. Each container will be labelled so you know what’s inside, fast or aggressive species are labelled with “Open with care” stickers. When unpacking the spider remove the lid and gently coax the spider with a implement like a pair of tweezers, pencil, paint brush or anything similar that isn’t your fingers. It is also advisable to do this without anyone else watching, the last thing you need when you’re trying to concentrate is someone shrieking and making you jump. Another good tip is to unpack the spider in your bath or a larger container so should it make a run for it, it can’t escape. Fast and Aggressive species are an “Open with care” sticker. 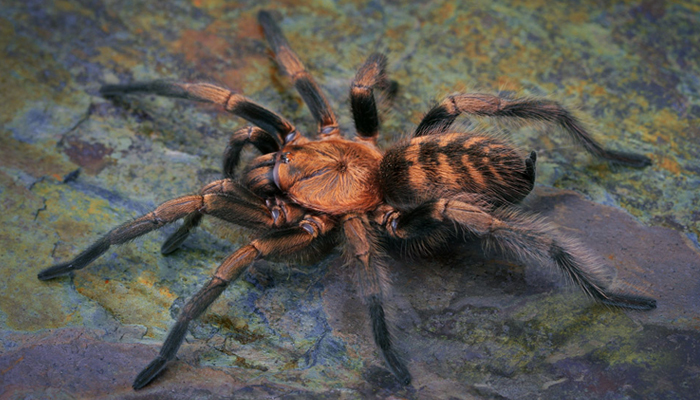 Spiders are best coaxed out of the container directly into the container. It is best to leave the spider(s) for approx. 4 days to settle before disturbing or attempting to feed. Arboreal and burrowing species, especially larger sized specimens might need a little longer to establish themselves before they feed. We check out all spiders are feeding before they are sent so if they don’t eat straight away don’t panic. Should there be any problems or your unhappy with your order please contact us immediately. In the unlikely event that a spider arrives dead or damaged we will either send a replacement on your next order or refund the cost as long as we are notified within 24hr of arrival. We may require a colour photo or the body sent back for inspection. If you are unsure about anything or require any further advice on your new pet give us a call, we will be happy to help.